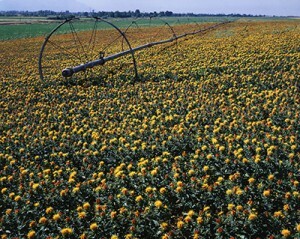 Safflower crop. 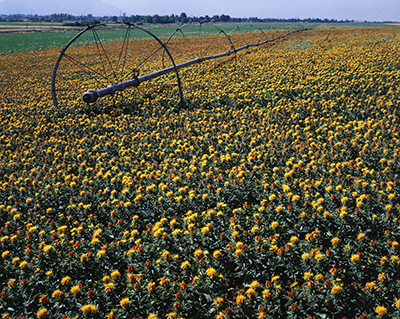 Photo credit: Jack Dykinga, USDA. Sep 4, 2013 • With unbiased Landsat imagery as evidence, the U.S. Court of Appeals for the 9th Circuit affirmed an earlier jury-conviction of a northern California farmer found guilty on 16 counts of filing false federal crop insurance claims—scheming the government out of $410, 372. Satellite imagery, including Landsat data, was entered into evidence and proved that a number of claims for crop losses were false. Imagery showed that a 2001 claim filed for a failed wheat crop was bogus, because no wheat crop existed at that time that could have been damaged by hail, wind, and excessive rain as claimed. Satellite imagery also showed that another claim was unsubstantiated because there wasn’t enough land cleared for half the acreage claimed lost; and, in another instance, satellite imagery showed that fields reported to be planted with safflower were actual sown with corn and alfalfa. Landsat imagery is especially useful for weeding out crop fraud because it is an unbiased source—anyone can download and use the data, it is regularly collected (every 8 to 16 days), reliably archived and made freely available (by USGS), and at a spatial resolution appropriate for looking at individual fields (30 m/pixel). In late August, the USDA’s Risk Management Agency, which manages the Federal crop insurance program, was awarded for improving crop insurance compliance using a massive data mining and analytics system. The system inputs claim histories, weather data, and MODIS and Landsat satellite data to identify spurious claims. This entry is filed under Agriculture, Data, News.